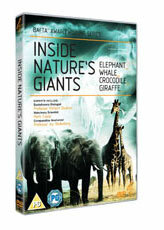 The Bafta® award-winning series that gets under the skin of the largest animals on the planet. Most wildlife documentaries show how animals behave, but by exploring their anatomy, Inside Nature's Giants reveals how these creatures really work. Veterinary scientist Mark Evans is joined by a team of experts in anatomy, evolution and behaviour to put some of the most popular and enigmatic large animals under the knife: an elephant, crocodile, whale and giraffe. Evolutionary biologist Professor Richard Dawkins will show how anatomy provides proof of natural selection, biologist Simon Watt looks at how the human body matches up, whilst Mark Evans shows the animals in action. All aided by enthusiastic, scalpel-wielding anatomist Joy Reidenberg, who loves nothing more than being knee deep in a dissection.